How many legs are in this picture? People are doing a double-take over this optical illusion that recently went viral. It all started when 18-year-old Marisol Villanueva, who lives in Granada, Spain, snapped a quick selfie of her outfit that day: an oversized sweater and a pair of black track pants. 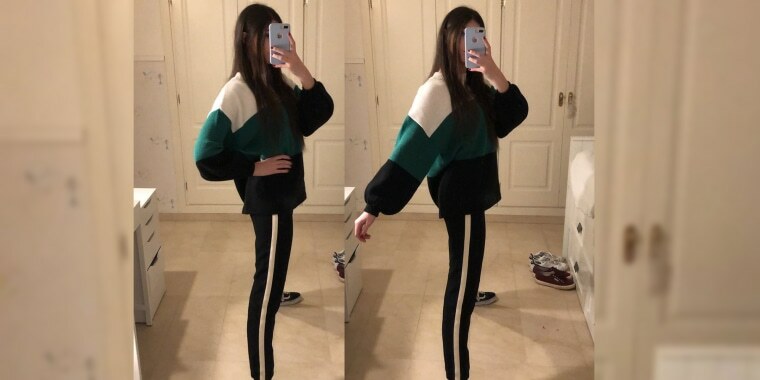 Seems straightforward, but a lot of people on Twitter thought the stripe on her pants was a gap between her legs, revealing the off-white floor in the background. And people couldn’t handle it. Villanueva’s post has gotten more than 40,000 likes and hundreds comments from people weighing in on which they saw: one leg or two. To be clear, there is, in fact, only one leg visible in the photo. Thanks to the angle and crop of the picture, Villanueva’s left leg is hidden behind the right with only her left shoe visible. But once you see the photo as showing two pencil-thin legs, it’s hard to unsee! This optical illusion may not be quite as confounding as the infamous white and gold dress (or was it blue and black? ), but it’s pretty funny!